Hosted and Moderated by Christopher Bavitz of the Cyberlaw Clinic. Several federal statutes authorize the Federal Bureau of Investigation to issue National Security Letters -- administrative subpoenas that require companies to disclose customer information relevant to national security investigations. In March 2013, the United States District Court for the Northern District of California held that gag order provisions in the NSL statute violated the First Amendment and that judicial review procedures violate separation of powers, declaring the entire statute unconstitutional. The court stayed its order pending the government’s appeal. The unnamed ISPs challenging the statute are represented by the Electronic Frontier Foundation. In the wake of recent leaks on national security activities vis a vis major online service providers, non-disclosure provisions in NSLs have come to the forefront of the national conversation on transparency for service providers and due process for their customers. 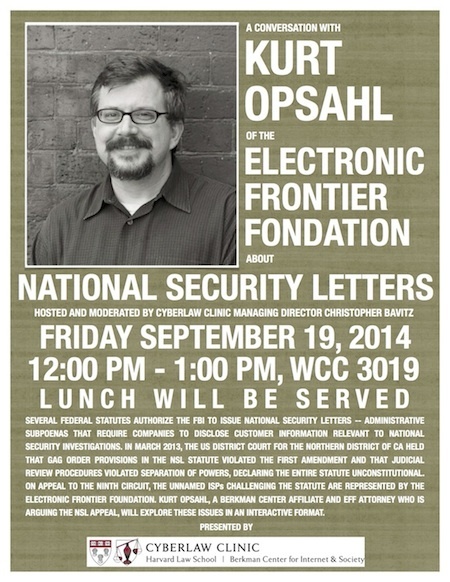 Kurt Opsahl, a Berkman Center Affiliate and EFF attorney who is arguing the NSL appeal, will explore these issues in an interactive format.